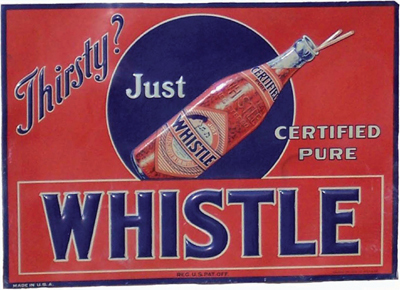 This antique valuable sign is orange, and advertises Whistle beverage. The center of the sign pictures an orange Whistle bottle in a blue circle. The bottle has two straws in it. “Thirsty? / Just Whistle / Certified Pure” the text reads. 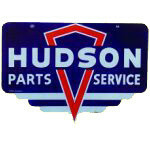 The lower portion of the sign has a large Whistle brand name in blue lettering.